My kitchen is done but that’s not stopping me from starting the next project. I have actually been working on the exterior of my house for a couple weeks now, I’ll be sharing much more later. 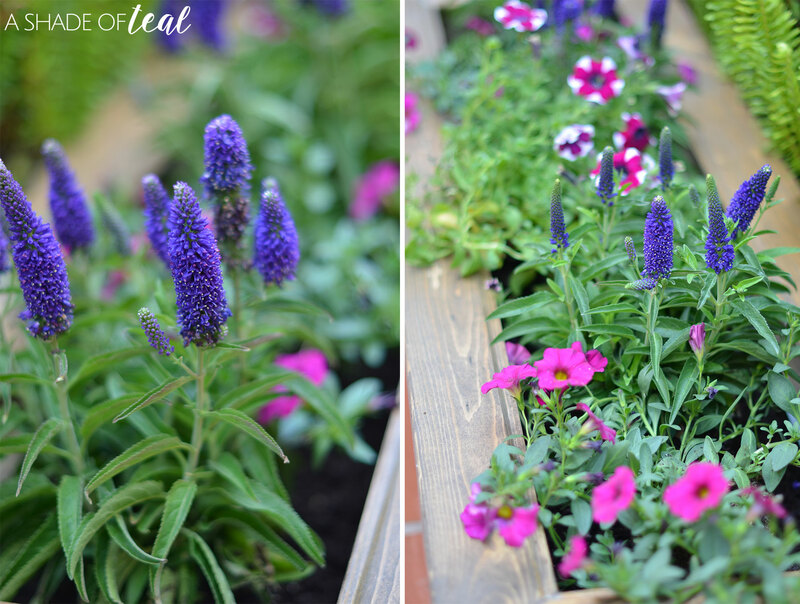 But with my recent front door & porch makeover I wanted to add some more color to the space. 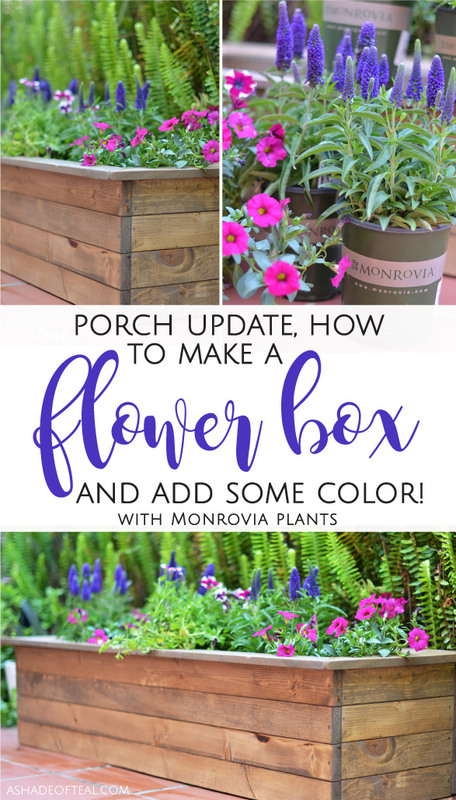 So I’ll show how to build a wood flower box and add some bright and beautiful flowers from Monrovia! To get things started you’ll need to gather your supplies. 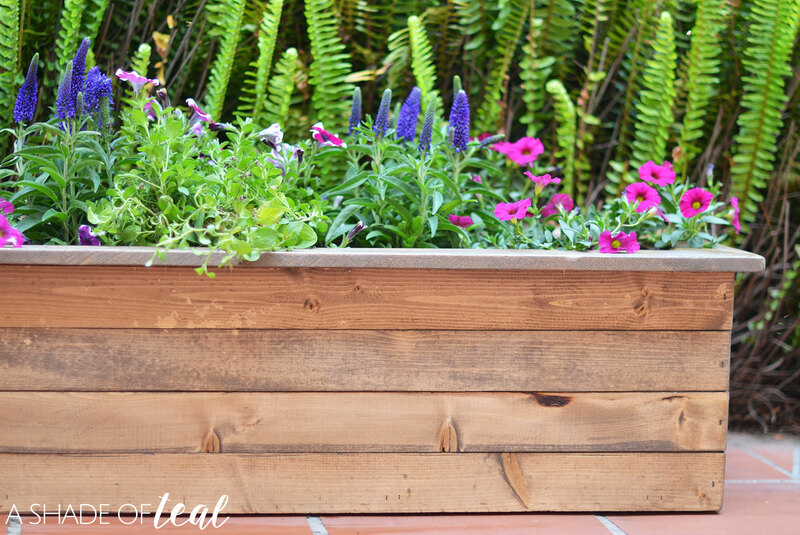 My flower box was 4′ long and 12 1/2″ wide by 11″ tall. 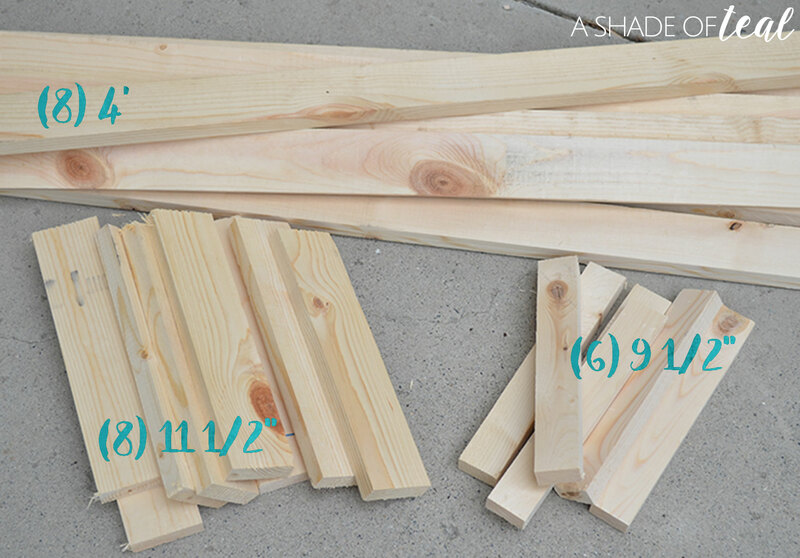 Additional wood for top, I used scrap wood but you can use additional pieces of the 2 1/2″ x 3/4″ lumber. Here’s how to assemble the box. Step 1 // Lay out the front & back boards like pictured. Step 2 // Add glue to the inside support strip. Step 3 // Nail the support strip down. I used 3 per side. Step 4 // Stand the front/back up on a level surface and start adding the side pieces 1 by 1. Don’t forget glue! Step 5 // The finished box should look like this. Step 6 // Cut the top wood to size at 45* angles. Step 7 // Add the top wood with nails and glue. Step 8 // Sand your box. Step 9 // Stain or paint the box. I suggest sealing the box with a polyurethane since it will remain outside. Once everything is dry your ready to start planting! I picked out 3 types of bright and colorful Monrovia flowers. They always have the best selection of Monrovia plants at Lowe’s, and I love buying Monrovia because their plants are nurtured with attention to every detail to ensure vibrancy and lasting beauty. Plus they offer a ton of important plant information on their plant tags and on their website. 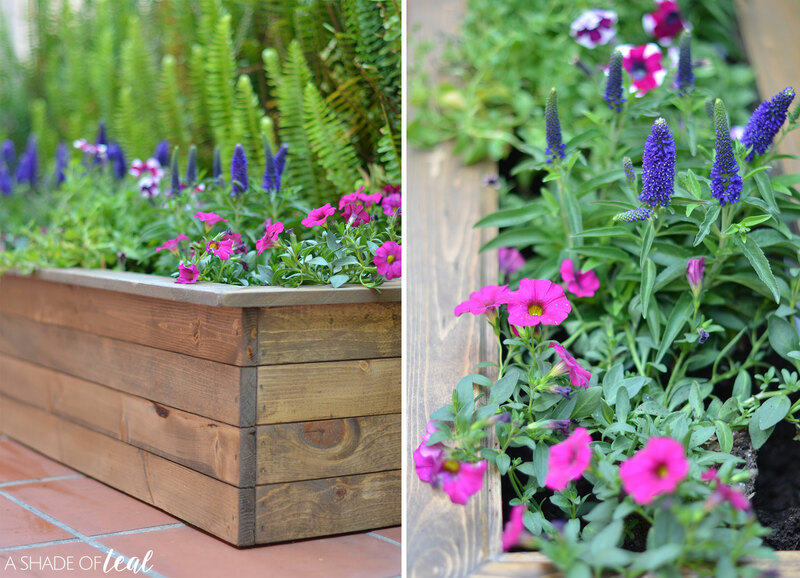 Making this flower box has made it easy to transform my space with colorful annuals and perennials. Since my front porch has this fern surrounding the entire thing it definitely needed some color, and that extra colorful detail makes all the difference with Monrovia plants. I love how my new flowers pop in the flower box! Did you know Monrovia grows the healthiest, highest-quality plants for you to create outdoor spaces that will thrive for years to come. 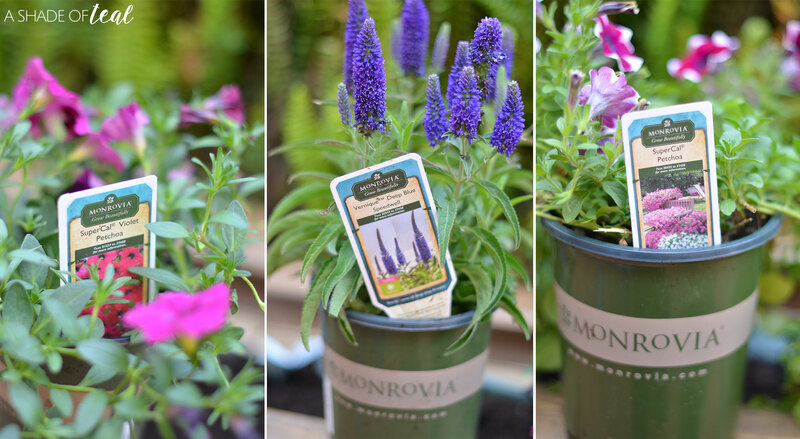 So go find a garden center that sells Monrovia flowers near you (HERE), and sign up for the Monrovia newsletter to get the latest details. « Modern Rustic Kitchen Makeover // ORC Week-6: The Reveal! I love this!! I need a smaller version of this. I will be sharing this post for sure. Thanks Tammy! It’s super easy to adjust to the size you need. These came out so nicely! You’ve inspired me to give it a try. The flower box looks so lovely and I also love the choice of plants. Unfortunately I am not known for being the greatest at woodwork or assembly but the list of supplies and step-by-step instructions and photos make me feel this is a project I could tackle with some degree of success. A weekend project to get immersed in. Thanks Nicole, it’s fairly easy to make. Good luck! This flower box is going to look fantastic on my deck. I will have to get the supplies I need to make one this weekend. I have been looking for a fun project to do. It will look amazing, happy building! It looks so nice and i am now thinking to create one of my won for flowers. I love gardening and i love flowers. Thanks for sharing this unique idea of flower box. Thanks Shirley, I’m glad you liked it! This is a really great in-depth tutorial. I love how natural it looks. perfect timing. I was looking at make one via Pinterest I’ve always wanted a flower box. That’s great, hope building goes well! I want to create some flower boxes. I am feeling like I need to spice up my patio with some cute plants/flowers. These will definitely do that! Your page brings me happiness. I love these garden hacks and could really get I to the swing of some therapeutic growing. Plus the cost are stunning!! 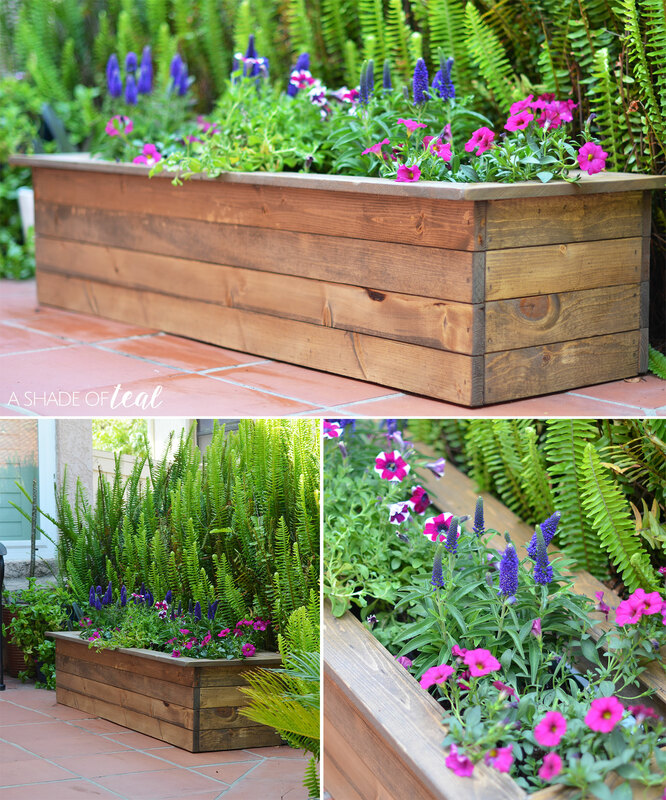 Really nice idea to make flower box.